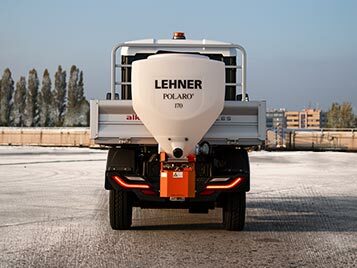 Electric-powered snow plough with Lehner Polaro salt spreader. With cold temperatures looming, for your company comes also the need to find the right electric utility vehicle with salt spreader and snow blade. Alkè vehicles are what you are looking for: electric, comfortable, efficient and they are able to move smoothly in any type of road. Winter is a very problematic season for road workers along large industrial areas or for those people who normally travel in our cities and countries. Alkè thought to face these problems with its winter service vehicle with salt spreader, which fits to each Alkè ATX model. 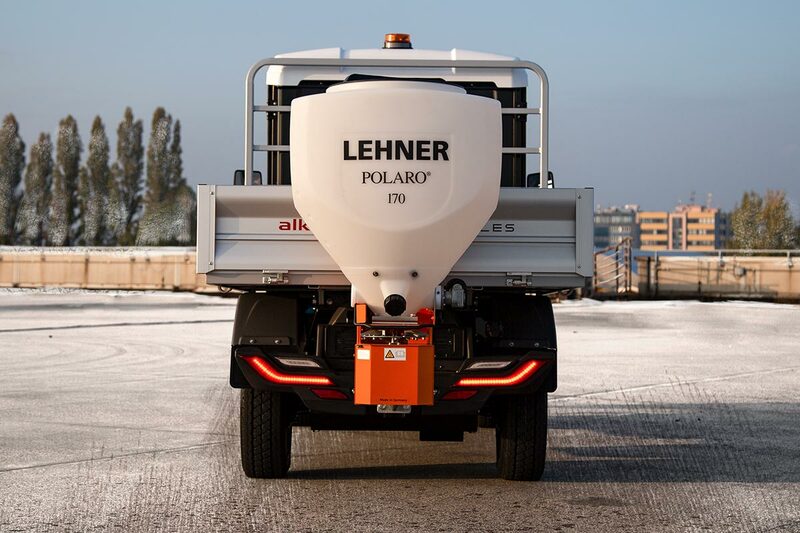 Alkè electric vehicle with salt spreader is definitely a great supporter against cold winter days and it is able to solve traffic problems arising from this situation. If necessary it is also possible to mount snow chains. It's impossible to miss the incomparable comfort and agility provided by an ATX winter vehicle with salt spreader. You can not only work in places otherwise hard to reach with classic gritter vehicles, but you can have also the benefit given by a totally eco-friendly electric vehicle. 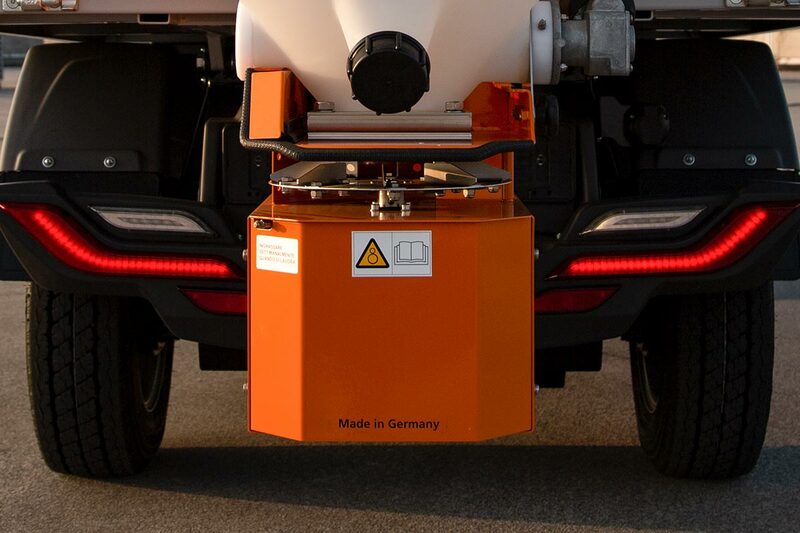 170 liters tank: this salt spreader can be used both in industrial areas, where snow may create big inconveniences, and in the urban areas, or in road maintenance in the municipalities of big cities and small towns. Its sizes in fact are perfect for working in tight areas such as narrow streets of historic centers, bike paths and sidewalks. 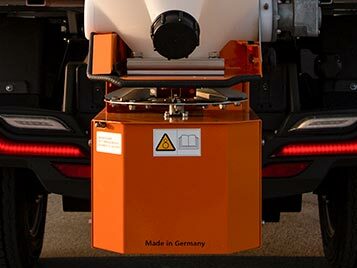 Quick hooking: thanks to its quick hooking anchor bracket, this accessory can be mounted – and at the same way unmounted - on Alkè ATX vehicles very quickly, in three minutes. 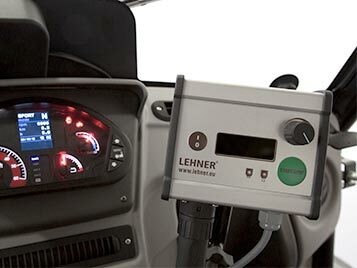 Cab controls: Alke' gritter is equipped with electronic cab controls, that allow you to have everything under control and also to adjust the width of the salt in output flow, from a minimum of 0.8 to a maximum of 6 meters. Alkè, in addition to the salt spreader, also recommends the snow blade, essential accessory for the winter season. Snow has decided to fall from the sky without warning? No problem, just mount the snow-blade on the Alkè vehicle - complete with hydraulic kit and hydraulic lifting-system - and the game is done! This Alkè accessory, with a length of 150 mm, moves up and down thanks to an electro-hydraulic mechanism and can be oriented towards right and left direction; it's also equipped with a springs system, for the emergency release. Furthermore, for a greater adherence to the ground, the lower part of the blade is made of a rubber shoe that can be replaced in case of wear. All Alkè ATX models are fully electric; this factor, definitely not negligible, implies a drastic reduction of vehicle's operating costs, eliminating the cost of fuel. Each Alkè electric vehicle is equipped with motor braking energy recovery, which prevents, in stopping phase, all waste of power and wear of brakes. 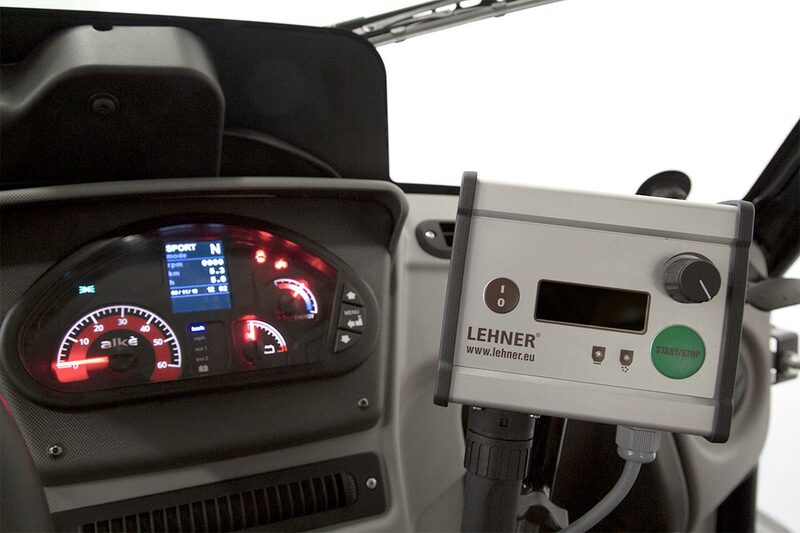 A full charge costs about € 2 and the vehicle will operate for an entire working day. Limit expenses and maximize productivity are key aspects for a company, big or small, but in the same way also the image has its value: choose to buy electric vehicles is firstly an ecologic choice that communicates and transmits positive values through environment interest, attention to resources and green commitment. Alkè ATX vehicles can be used both in private areas and on the road, as they are approved vehicles. All Alkè vehicles are 100% made in Italy.